The Brazilian Bossaball team is flying back to Rio de Janeiro jubilant, after winning the Cup at the first Zain International Bossaball Tournament. Brazil, Spain, AUK and GUST were the four teams competing in the one-day tournament which was held on Friday at the Marina Crescent. 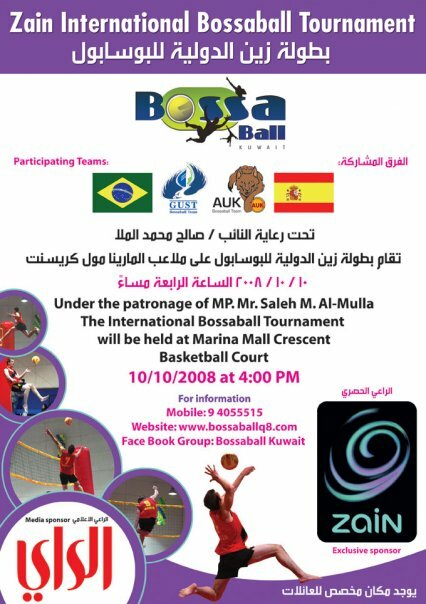 The first ever international tournament of Bossaball to be held in Kuwait kicked off at 5 pm with the first game played between Spain and AUK with Spain winning 25-9/25-12 followed by a game between Brazil and GUST where Brazil won 25-13/ 25-15. In the final match Brazil beat its fierce competitor Spain 25-15/25-21. Bossaball was first played in Kuwait in the beginning of July 2008 through an exhibition match between GUST University and the Spanish Bossaball teams. After this first launch, in collaboration with Bossaball HQ, a new plan was set up after AUK University also had expressed serious interest in developing the sport concept. Each University invited one international coach during several weeks in order to train new Bossaball players at both universities with the idea to form several teams. Following these training sessions, an internal university tournament was set up between the different teams at each university and the winner of each tournament was then selected automatically for the International tournament at The Marina Crescent. 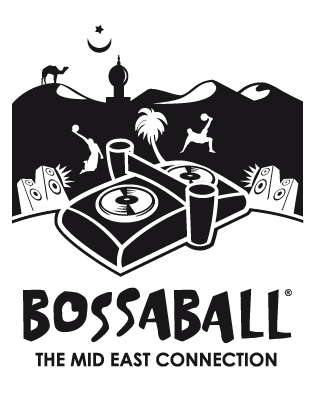 The teams were able to prove, to the 1000-plus crowd who attended the event, that Bossaball is a game that is not only enjoyable for the players but also for the spectators. The crowd which started flocking to the Marina Crescent an hour before the start of the tournament was entertained by the tremendous performance of the Bossaball teams. Watching the players’ nimble agility on the inflatable bouncers and trampolines while showing off their volleyball, football and gymnastics skills was by far the most entertaining scene for the spectators. The players were able to get the spectators hooked on to the game right from the very first serve of the first game. Instead of just hitting the ball with their hands, some of the players showed off their creative serves and playing techniques which included flipping around with the ball between their legs before tossing it over to the other side.The atmosphere in the crowd was very joyful as each university had attracted a lot of fans to support their teams. Bossaball is considered one of the newest games in the world’s sports arena. The game which is a combination of football, volleyball and gymnastics was invented three years ago. The popularity of the game gained instant recognition in some countries of Asia, Europe and South America, with brazil and Spain evolving as the top contenders in the game. The main person behind Kuwait’s foray into the Bossaball field is Mohammad Al-Taqi, the Head of Bossaball Kuwait and the Coach of GUST’s Bossaball team. “Bossaball was only introduced to Kuwait in 2008 after I invited Bossaball officials from abroad to start setting up the game in Kuwait and we succeeded in putting together two teams here (GUST and AUK),” Al-Taqi told Kuwait Times. Al-Taqi has been coaching GUST’s team since June 2008 and believes that their performance has improved remarkably since then. He added, “The only problem with the game, here in Kuwait, is the fact that gymnastics is not really popular here (Kuwait), so the players need more training in that area.” However, Al-Taqi affirmed that the GUST and AUK teams are capable of competing in international tournaments and the Zain International Bossaball Tournament was just the start. “In November the GUST team will part icipate in an international Bossaball tournament that will be held in Abu Dhabi, UAE and we are expecting a good ranking there,” he said. Sharifa Al-Adwani, the Coach of AUK’s Bossaball team also believes that Kuwait can excel in this sport. “In Kuwait, we are always interested in new things and we tend to invest ourselves in them and I truly believe that such new ideas can grow here,” she stated. Al-Adwani was originally the volleyball coach at AUK for the past three years and has only been coaching her team for a couple of days. She explained, “I’m their volleyball coach and I don’t know much about the rules of Bossaball but because of the similarity between the two games, I found it possible to coach them.” According to Al-Adwani, AUK put up a good performance in the tournament. She said “AUK’s players started practicing four weeks ago and I think they did a great job today (Friday). The tournament was sponsored by Zain and was attended by Abdul Wahab Boodai, an official from the department of Communications and Relations at Zain. Boodai explained that Zain evinced a keen interest in sponsoring the event due to the growing popularity of Bossaball in Kuwait. “At Zain, we’ve been observing the popularity of this new game here and we found out that a lot of the Kuwaiti youth are interested in participating and watching this sport and we (Zain) are just catering to their needs,” Boodai stated. The first Zain International Bossaball Tournament is considered a success not just for the teams and the spectators that enjoyed their performance but is also a success for Kuwait as a host in promoting new sports tournaments in the Middle East.